What does a veterinarian's physical exam of a pet rat look like? 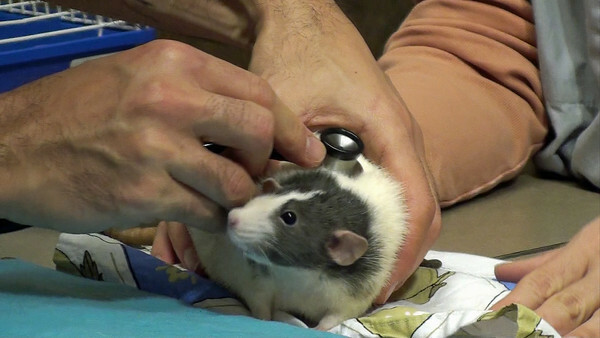 This gallery provides video examples of veterinarians giving skilled physical exams to pet rats. The exams cover many components of a full exam, as well as special diagnostics for problem symptoms. The videos do not necessarily indicate diagnoses, because a full assessment and diagnosis cannot be concluded from merely watching a video. Instead, these videos are intended to educate pet rat owners to some of the procedures done during a variety of physical exams. The videos may also give pet rat owners a visual sense of how a good vet handles a pet rat to help her stay calm. You should always feel comfortable with your vet and how s/he handles your rat. Your rat should feel as comfortable as possible. All procedures should aim to minimize stress. You may want to view these videos before you see a new vet for the first time, or to compare them to your current vet's human-rat 'interpersonal skills'. 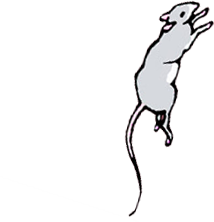 In addition, become educated about rat health physical exams of pet rats by reading great material such as Rat Guide's ADVANCED HEALTH CHECK, or the layperson's basic version, Rat Guide's BASIC HEALTH CHECK, and Rat Guide's Signs of Pain in Rats. The veterinarians in these videos have volunteered their time and have not received compensation of any form for their work. They have generously shared their knowledge and skill in the interest of improving health care for pet rats generally. They did not have final editing rights to the film, and do not own them. Final content is entirely the responsibility of the editor, and questions or concerns about content should be directed to the owner of JoinRats via the Contact page. Suggestions for improvements, or clarification comments that should be added, are entirely welcome. NOTE REGARDING VIEWING HIGH DEFINITION VIDEO: Many computers, particularly older models, but also newer models, may have trouble viewing high definition video. After you click to play the video, you will see options at the top for different sized reductions. After you have clicked to reduced the size, click the pause button on the bar, and allow the green bar to load to the end of the video. Doing this will allow the video to fully load, which will reduce stops and starts during playback. Then click play. You may have difficulty on wireless networks, and it is recommended to close all other applications while viewing video. Dr. Anthony Pilny, located in the New York metropolitan area, gives a basic exam to healthy volunteer Karen Rat.